In second round of junior hurling championship we meet Diarmuid O Mathuna's at Enniskeane on Saturday evening, 22nd July.Throw in at half past seven. The second round football championship fixture, Randals v Bantry Blues, has been confirmed for next Saturday evening, 15th July, throw in at eight o'clock.Extra time to be played if necessary. We are at home to Glengarriffe in the football league on tomorrow, Friday, evening 9th June.Throw in time - eight o'clock. Munster Senior Football semi-final Cork v Tipperarary Saturday June 10th at 5pmPairc Ui RinnTICKET INFORMATIONAdult pre-purchase €15Juveniles/Under 16s FreeTickets available locally from usual outlets. The venue for tonight's hurling championship match, v Whites Cross, has been changed again and is now scheduled to be played at Brinny.The throw in time is the same - half past seven. The junior hurling championship quarter-final against Whites Cross has been moved from Kilmichael and will now be played in Newcestown. 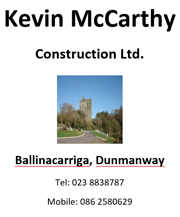 Junior hurling match at home to Kilbrittain this evening, Tuesday, at eight o'clock. Venue for Junior football championship match v Grange on next Saturday has been moved to Brinny. Throw in time half past seven. Junior football league match v Castletownbere scheduled for Ballinacarriga this, Saturday, evening has been called off.Castletownbere team unable to field.